Home » facebook » social media » 12 Things You Should Remove from your Facebook Page Today. 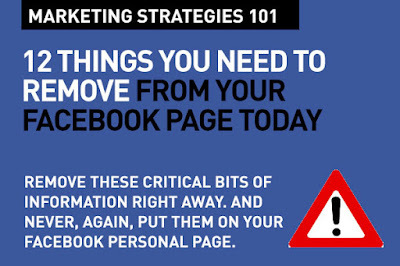 12 Things You Should Remove from your Facebook Page Today. The problem with what you post on Facebook is it's out there for every one to see. Here are 12 absolutely critical bits of information you should delete right away. Like now. I test dropped in on 50 of my Facebook friends just before writing this post – and not a single one of them had their profile as 'Private'. Which means anyone can access their information at any time. Facebook is a fact of modern life, and the arrival of smartphones has made the process of updating your status a one-click process. Most of us give far less thought to what we post online than in the days when we had to go home and switch on our computers before telling the world what we had been up to. Occasionally we make mistakes, posting an embarrassing photo or an angry comment. By signing up to social networking sites we also consciously agree to them using our personal data to some degree. These are 12 things you should delete now. Criminals love it when you post your complete home address on Facebook. Your home becomes an easy target. While it may seem cool to post your home address (My Pad, My Crib, whatever) on any social platform, don't. Delete it now. You may love getting so many posts on your timeline and messages because people know your birthday, but technically, you are actually, providing parts of your bank information details when you do. They can piece this information, along with your name, your address and try and put the other pieces of the puzzle together. 4. "Friends" who aren't really your friends. Those days of bragging about how many 'Friends' you have on Facebook are long gone. And, you're not a brand, unless, say, you're Taylor Swift. Oxford psychology professor Robin Dunbar found that of their Facebook friends, 4.1 were considered dependable, and only 13.6 exhibited sympathy during an “emotional crisis.”. Get rid of the friends whose request you accepted thinking you might have vaguely known them. Lose the ones right away who you cannot remember who they are. That will not only improve your quality of your friends' circle, but also make it more rewarding for you in the longer term. Immediately delete those adorable and cute photos of your younger children. You are simply handing over bait for sexual predators and offenders. Also do not post photos of other people's children. According to the online recruitment site Career Builder, around a fifth of employers use social networking sites to research job candidates, and close to 59% say they would be influenced by a candidate’s online presence. University admissions tutors are also rumoured to Google candidates, although the extent to which this occurs is unknown. Unfortunately, we live in a time when pedophiles are smarter than they used to be. You need to protect your kids by not giving away too much info about them online. please don't post pics of your kids in the bathtub or running around naked. Don't feed the pedophiles. Delete any such photos now, now. Delete any information about where your younger children go to school. Here, again, you are providing leads for offenders and predators. If you have your home address, and also where your kids go to school, those are direct directions for the really bad people who may stalk or try and nab your kids on the way. It may hurt your sense of pride, specially if your kids go to an elite school you are really proud of, but that actually is even worse. In some countries, this may even lead to kidnapping. Social media platforms ask you for your location – it's part of social advertising, they need that data. But no one else really needs to know. Sure, you love checking in to places, but when you do, every one knows where you are and that you're not at home. It means a wily burglar can break in and empty your home of valuables, or worse, come and pry on your kids who may be home with just the babysitter. Any one who wants to hurt you knows where you are. Don't post. Delete this. 8. Complaints about your boss or management. And your management. Delete all posts that are angry, heat of the moment negative comments about your work place. It may be tempting to "air our grievances" on social media, but you will look silly and you'll also be found out by your boss, your manager, or even by a colleague who just like you that much. Delete all negative workplace related posts right away. Just to be safe, you should also delete your boss. Or your entire senior management. Seriously. Your CEO can access your wall, so can HR and they have access to every single one of your status updates - and yes that includes the one moaning about work. Or when you came in to work late with a hang over. You get the drift. Delete. 9. Where and when you are going away on holiday. It's OK to share those wonderful shots of you on the beach in Bali afterwards. But never post your holiday dates, your destinations ahead. If you have, delete it now. For some insurance companies, travellers who are burgled while they are on holiday may not get their insurance claim accepted if they posted their holiday plans on their social media accounts. This is a delete immediately item. If by any chance you brag about that new credit card you just got with premium written all over it, take a photo and post it, you are setting yourself up for fraud. Delete this immediately. Delete any posts you have involving credit card details. You may be posting on a brand page saying how they misplaced your order, and which card you used, but that is really wrong. Delete those now. Yes, it's OK for your profile to say you are married, but if you are proud of a new relationship, don't do it on Facebook. It may not work out, and the consequent "in a relationship" to "single" status change will make you feel worse than you already do. Also many changes to your status makes you look kind of dodgy, doesn't it? Also delete any bitter comments and posts on relationships gone sour. Makes you look pathetic, really. I wouldn't have mentioned this, but this has become a suspect area lately. With so much hatred, so many terrorist groups, so many radicals, in this day and age, you need to be careful on how you are attracting the wrong kind of attention. 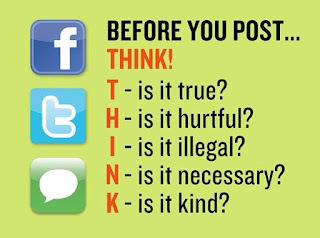 Specially if your views are far leaning to one side, delete those posts. Extremist and radical groups have huge teams working on social media, and they may be monitoring what you say. That's how they lure in new recruits, and that's how they plan to eradicate the ones against them. Delete. That's Digital Marketing Strategies 101. 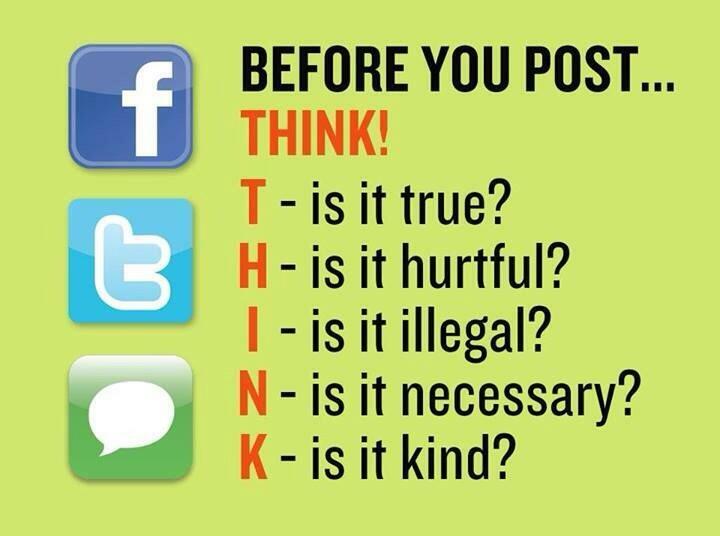 Very very useful reminders on what not to post on Facebook, or any other social media. Thanks. Very useful advice – which is really common sense. But we forget.